Pewter Keychains, Travel Mugs, Christmas Ornaments! Great for the Holidays! 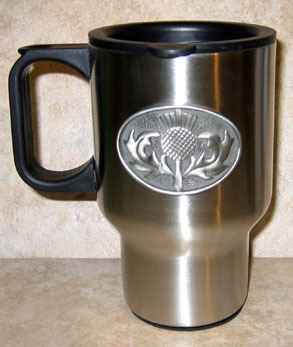 Scottish Celtic Travel Mug with Thistle pewter emblem. Scottish Thistle Celtic Keychain. Traditional phrase: The Thistle O’Scotland Suaicheantas Na H-Alba. Keychain size: Fob approximately 1.55" by 2.14", Total length approximately 4.4"